Once a week, I meet up with some friends (other parents from my children’s school) for a morning coffee at a little local pub/cafe. It can often be quite an eclectic group, comprising of Japanese, Swedish, American, Ni-Vanuatu and of course a few Australians added to the mix. Spending time amongst this small but diverse array of nationalities, I most love the fact that there’s often such interesting and varied perspectives as we sit and chat about all manner of things. It reaffirms for me that we can learn so much from each other and that in doing so, the world somehow doesn’t feel quite so vast anymore. The following recipe, inspired by this lovely lady, has been readily welcomed into our home. It’s simple to prepare, beautifully aromatic in the kitchen and so full of flavour. In a small saucepan, combine the soy sauce, mirin, sake, raw sugar, garlic and ginger. Place the pan over medium to high heat and bring to a boil, stirring occasionally to ensure the sugar has dissolved. Once bubbling, reduce the heat and allow to simmer for about 10-15 minutes or until slightly syrupy. Be sure to taste as you go, to ensure a sauce well balanced in flavour. Remove the pan from the heat and allow to cool to room temperature. Strain the sauce to remove the chunks of garlic and ginger. 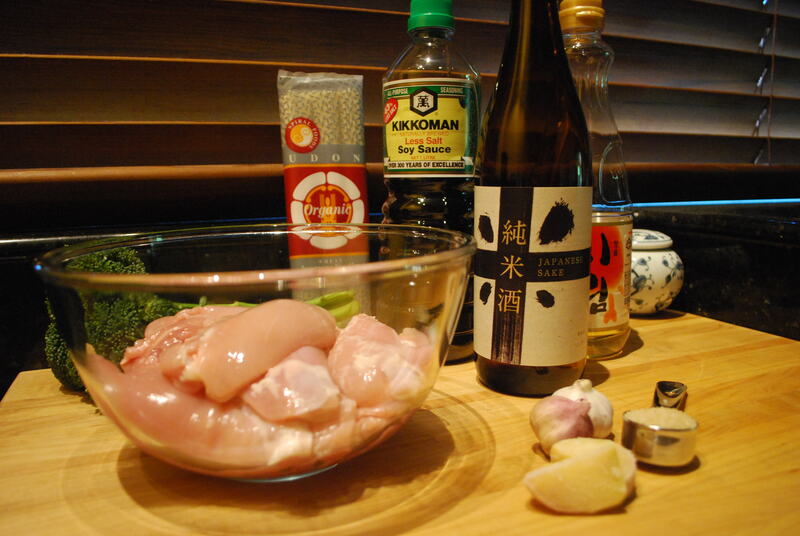 In a glass or ceramic bowl, marinate the chicken thigh fillets with the cooled Teriyaki sauce, cover and refrigerate for several hours (if time permits). I prefer to bring all meat to room temperature before I cook it, so approximately one hour before I plan to start cooking I’ll remove the chicken from the refrigerator. Please feel free to make your own decision regarding this step. Bring a large saucepan of water to the boil for the noodles. Depending on the noodles, these will usually take about 10 minutes to cook. Use your own judgement (after reading the next two steps) as to when you should put the noodles in to cook. Heat the oil in a large frying pan over medium heat and gently fry the chicken pieces (being sure to reserve the marinade). Feel free to brush a little more of the marinade onto the chicken pieces as they cook. Once done, remove the chicken from the pan to rest somewhere warm for a few minutes while you finish off the sauce. Pour the remaining sauce that the chicken was marinating in, into the frypan and bring to a boil, allowing it to simmer and reduce for about 5 minutes. 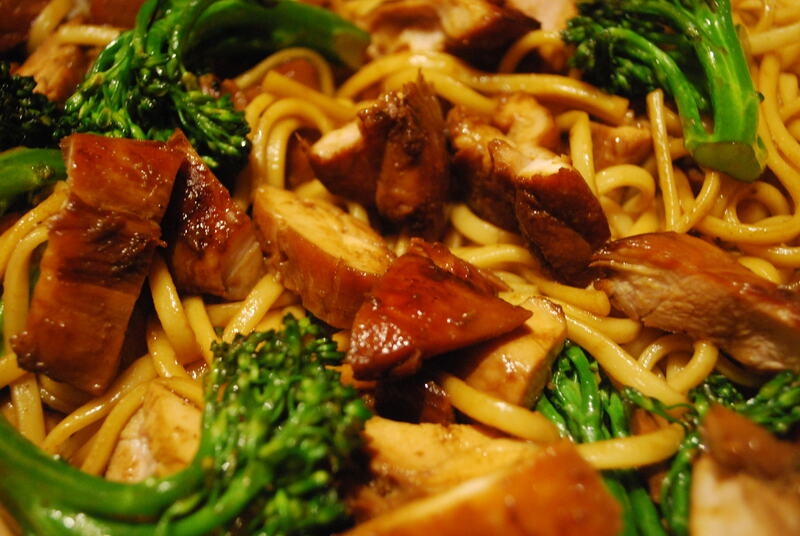 I like to add the broccoli (or other green veggies) in with the sauce while it simmers – though please feel free to steam or boil them separately to your liking and serve on the side or toss through with the noodles and chicken at the last minute. To serve, slice the chicken into bite-sized pieces and combine with the noodles, extra sauce and vegetables in a large serving bowl. I initially tried using normal soy sauce in this recipe and it was way too salty. Very strongly recommend that you purchase a salt-reduced soy sauce. Great also served with rice, instead of the noodles. Works beautifully with beef, salmon/other fish or even mixed vegetables. 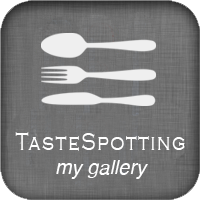 This entry was posted in Chicken Dishes, Cooking, Food, Japanese Food, Mains, Recipes and tagged Chicken with Teriyaki Sauce, Gather and Graze, Sake, Udon Noodles on 10/05/2013 by Gather and Graze. Oh, me too! This marinade is fabulous for a batch of chicken wings too – great served with jasmine rice, sprigs of fresh coriander/cilantro and a sprinkling of sesame seeds. This looks delicious! I’m always on the look out for new Udon noodle dishes to try.